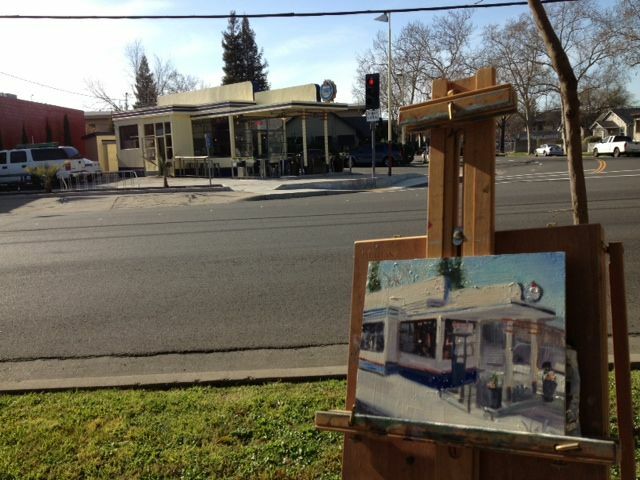 Weather has been beckoning me to paint outside for the last month or so in Sacramento. The warm spring temperatures make it perfect for plein air painting. Yesterday I gathered my paint things and soon found myself in front of Tako - Korean BBQ. Being in a new city has opened me up to a whole new batch of buildings, people, and sites. Still interested in finding relics of the past, I came to Tako - Korean BBQ, an old gas pump station turned into modern eatery. When an artist only has a few hours to capture a scene, before the light changes, they have to work quickly. This gives the painting a loose and airy quality that most studio paintings don't have. Overall it was a wonderful day and the beginning of many more outdoor painting sessions. Not only did I have the sun shining, but an audience as well.